Human cytochrome P450 (CYP) isoforms involved in amiodaroneN-deethylation were identified, and the relative contributions of these CYP isoforms were evaluated in different human liver microsomes. The mean KM andVmax values of amiodaroneN-deethylation in microsomes from six human livers were 31.6 ± 7.5 μM and 1.2 ± 0.7 pmol/min/pmol of CYP, respectively. Ketoconazole and anti-CYP3A antibodies strongly inhibited amiodarone N-deethylase activity in human liver microsomes at a substrate concentration of 50 μM. Of 15 recombinant human CYP enzymes (19 preparations), CYP1A1, CYP3A4, CYP1A2, CYP2D6, CYP2C8, and CYP2C19 catalyzed amiodarone N-deethylation. The amiodarone N-deethylase activity at a substrate concentration of 5 μM was significantly correlated with the paclitaxel 6α-hydroxylase activity (r = 0.84,P < .05) in the human liver microsomes, whereas the amiodarone N-deethylase activity at 100 μM was significantly correlated with the testosterone 6β-hydroxylase activity (r = 0.94, P < .005). According to the concept of relative activity factor, it was clarified that CYP2C8 as well as CYP3A4 were significantly involved in amiodarone N-deethylation in human livers at clinically significant concentrations and that the contributions of CYP1A2, CYP2C19, and CYP2D6 were relatively minor. However, there was a large interindividual variability in the contribution of each CYP isoform to amiodarone N-deethylase activity in human liver; the relevance of these enzymes would be dependent on the content of the respective isoforms and on the amiodarone concentration in the liver. Cytochrome P450 (CYP)1 consists of a superfamily of heme-containing monooxygenases that are associated with the metabolism of substrates, such as drugs, environmental pollutants, and endogenous substrates, and have broad overlapping specificities (Guengerich, 1991). It is not unusual for a compound to be metabolized by several CYP isoforms. Identification of isoform(s) involved in the biotransformation of a compound would enable clinicians to predict and/or avoid drug interactions that might compromise therapeutic efficacy. Amiodarone is an iodinated benzofuran derivative, which is extremely effective in the treatment of life-threatening supraventricular and ventricular arrhythmias such as ventricular fibrillation or hemodynamically unstable ventricular tachycardia (Gill et al., 1992), with predominantly Class III (Vaughan Williams' classification) antiarrhythmic effects. Amiodarone has been shown to have a long serum elimination half-life of 40 to 50 days (Kannan et al., 1982; Holt et al., 1983; Stäubli et al., 1983), which was attributed to its huge distribution. It has been reported that its primary metabolite, desethylamiodarone, is pharmacologically active and shows comparable antiarrhythmic effects to its parent compound (Pallandi and Campbell, 1987; Kato et al., 1988). It has been suggested that a number of drugs administered concomitantly with amiodarone, such as theophylline (Hirsch et al., 1993), phenytoin (Nolan et al., 1989), warfarin (O'Reilly et al., 1987; Heimark et al., 1992), and flecainide (Funch-Brentano et al., 1994), cause drug interactions in the clinical situation. In our previous study, it was clarified that desethylamiodarone has more potent inhibitory effects than amiodarone on CYP activities (Ohyama et al., 2000). Therefore, drug interactions caused by coadministration of amiodarone have been suggested to be caused by the inhibition of CYP activities by desethylamiodarone (Ohyama et al., 2000). It has been reported that amiodarone N-deethylation is catalyzed by CYP3A (Fabre et al., 1993; Trivier et al., 1993). However, in these in vitro assay systems, the low solubility of amiodarone was not taken into consideration. Therefore, in the present study, we improved the assay procedure to clarify the CYP isoform involved in the transformation of amiodarone to desethylamiodarone in human liver microsomes. In addition, the contributions of each CYP isoform to amiodarone N-deethylation in human liver microsomes were estimated by the relative activity factor (RAF) using microsomes from baculovirus-infected insect cells expressing human CYP. The present study is the first to clarify the significant role of human CYP2C8 in amiodarone N-deethylation. Amiodarone hydrochloride (2-butyl-3-benzofuranyl 4-[2-(diethylamino)ethoxy]-3,5-diiodophenyl ketone hydrochloride) and desethylamiodarone (2-butyl-3-benzofuranyl 4-[2-(monoethylamino)ethoxy]-3,5-diiodophenyl ketone) were kindly provided by Taisho Pharmaceutical (Tokyo, Japan). 7-Ethoxyresorufin and resorufin were purchased from Sigma Chemical Co. (St. Louis, MO). Paclitaxel was kindly provided by Bristol-Myers Squibb Pharmaceutical (Tokyo, Japan). 6α-Hydroxypaclitaxel, S-(+)-mephenytoin, (±)-4′-hydroxymephenytoin, (±)-bufuralol hydrochloride, and 1′-hydroxybufuralol maleate were from Ultrafine Chemicals (Manchester, UK). Testosterone, 6β-hydroxytestosterone, and 11β-hydroxytestosterone were from Steraloids (Wilton, NH). NADP+, glucose 6-phosphate, and glucose-6-phosphate dehydrogenase were purchased from Oriental Yeast (Tokyo, Japan). Anti-rat CYP1A2 rabbit serum, anti-rat CYP2C13 goat serum, anti-human CYP2D6 rabbit serum, and anti-rat CYP3A2 rabbit serum were from Daiichi Pure Chemicals (Tokyo, Japan). Other chemicals were of the highest grade commercially available. Microsomes from baculovirus-infected insect cells expressing CYP1A1, CYP1A2, CYP1B1, CYP2A6+b5, CYP2B6+b5, CYP2C8, CYP2C8+b5, CYP2C9, CYP2C9+b5, CYP2C18, CYP2C19, CYP2C19+b5, CYP2D6, CYP2E1+b5, CYP3A4, CYP3A4+b5, CYP3A5, CYP3A7+b5, and CYP4A11 were obtained from Gentest (Woburn, MA). These were all coexpressed with NADPH-cytochrome P450 oxidoreductase (OR). Human liver microsomes (HLG1, HLG4, HLG6, HLG7, HLG10, and HLG11) and pooled human liver microsomes (lot #2, comprised of 20% each of specimens HLG1, HLG3, HLG13, HLG14, and 10% each of specimens HLG4 and HLG6) were also purchased from Gentest. The specific catalytic activities of each CYP isoform in these microsomes were provided in the data sheets by the manufacturer. The determination of amiodarone N-deethylase activity in human liver microsomes or microsomes from baculovirus-infected insect cells was performed by HPLC. A typical incubation mixture (0.2 ml of total volume) contained 50 mM potassium phosphate buffer (pH 7.4), 4% BSA, an NADPH-generating system (0.5 mM NADP+, 5 mM glucose 6-phosphate, 5 mM MgCl2, 1 U/ml glucose-6-phosphate dehydrogenase), 50 μM amiodarone, and 0.25 mg/ml microsomal protein of human livers or 12.5 or 25 pmol/ml CYP content of microsomes from baculovirus-infected insect cells. The reaction was initiated by the addition of the NADPH-generating system and incubated at 37°C for 30 min after a 1-min preincubation. The reaction was terminated by the addition of 100 μl of ice-cold methanol, and α-naphthoflavone (200 pmol) was added as an internal standard. The reaction mixture was extracted twice with 2 ml of dichloromethane for 1 min. The organic layer was transferred to a clean test tube and was evaporated under a gentle stream of nitrogen at 40°C. The residue was redissolved in 200 μl of mobile phase, and a 100-μl portion was subjected to HPLC. Kinetic studies were performed using microsomes from six different human livers and from baculovirus-infected insect cells expressing human CYP. In determining the kinetic parameters, the amiodarone concentration ranged from 5 to 200 μM. HPLC analysis was performed using an L-7100 pump (Hitachi, Tokyo, Japan), 712 WISP intelligent sample processor (Waters, Tokyo, Japan), Chromato-integrator D-2000 (Hitachi), and CTO-6A column oven (Shimadzu, Kyoto, Japan) with a Capcell Pak CN UG120 (4.6 × 150 mm; 5 μm) column (Shiseido, Tokyo, Japan). The eluent was monitored at 240 nm using an SPD-6A UV detector (Shimadzu). The mobile phase was 35% acetonitrile, 1% acetic acid, and 0.2% diethylamine. The flow rate was 1.0 ml/min, and the column temperature was 35°C. Under these conditions, retention times of α-naphthoflavone, desethylamiodarone, and amiodarone were 6.5, 9.5, and 13.0 min, respectively. The detection limit of desethylamiodarone was ∼100 pmol with a signal-to-noise ratio of 3:1. The intra- and interday variation coefficients did not exceed 10% in any of the assays. CYP-specific inhibitors were screened for their effects on amiodaroneN-deethylation in pooled human liver microsomes at an amiodarone concentration of 50 μM. The inhibitors studied were fluvoxamine (Pastrakuljic et al., 1997), furafylline (Tassaneeyakul et al., 1993), coumarin (Yun et al., 1991), sulfaphenazole (Baldwin et al., 1995), paclitaxel (Rahman et al., 1994), quercetin (Rahman et al., 1994), S-mephenytoin (Chiba et al., 1993), quinidine (Guengerich et al., 1986; Broly et al., 1989), chlorzoxazone (Peter et al., 1990), erythromycin (Watkins et al., 1985), and ketoconazole (Watkins et al., 1985). With the exception of paclitaxel, which was dissolved in dimethyl sulfoxide with a final solvent concentration in the incubation mixture of 1%, the inhibitors were dissolved in methanol or water, and the final concentration of solvent was <0.1%. Amiodarone N-deethylation was determined as described above. The immunoinhibition of amiodarone N-deethylation was examined by preincubation of pooled human liver microsomes with various concentrations of anti-rat CYP1A2 serum, anti-rat CYP2C13 serum, anti-human CYP2D6 serum, and anti-rat CYP3A2 serum on ice for 1 h. Amiodarone N-deethylase activity was determined as described above at a substrate concentration of 50 μM. The cross-reactivities of these antibodies to human CYP isoforms were evaluated by the manufacturer. It has been provided that anti-rat CYP1A2, anti-human CYP2D6, and anti-rat CYP3A2 sera react only with human CYP1A2, CYP2D6, and CYP3A4, respectively; anti-rat CYP2C13 serum reacts with human CYP2C8 > CYP2C9 > CYP2C19. Ethoxyresorufin O-deethylase activity, bufuralol 1′-hydroxylase activity, and testosterone 6β-hydroxylase activity were determined as described previously (Nakajima et al., 1999a). These substrate concentrations ranged from 0.1 to 2, 1 to 10, and 5 to 200 μM, respectively. Paclitaxel 6α-hydroxylase activity (Yamazaki et al., 1999) and S-mephenytoin 4′-hydroxylase activity (Nakajima et al., 1999b) were determined as described previously with substrate concentrations of 0.5 to 20 and 10 to 200 μM, respectively. Contributions of CYP1A2, CYP2C8, CYP2C19, CYP2D6, and CYP3A4 to Amiodarone N-Deethylase Activity in Human Liver Microsomes. The contributions of each CYP isoform to the amiodaroneN-deethylase activity in human liver microsomes were estimated. The percentages of the contributions were estimated by the application of the RAF (Crespi, 1995) using clearance (CL) values (RAFCL) (Nakajima et al., 1999a). The CL values were determined as the ratios of theVmax/KM. The marker activities used in this study were ethoxyresorufinO-deethylase activity for CYP1A2, paclitaxel 6α-hydroxylase activity for CYP2C8, S-mephenytoin 4′-hydroxylase activity for CYP2C19, bufuralol 1′-hydroxylase activity for CYP2D6, and testosterone 6β-hydroxylase activity for CYP3A4. The RAFCL values for CYP1A2, CYP2C8, CYP2C19, CYP2D6, and CYP3A4 were determined using the equation as follows:RAFCL­CYPx=CL in human liver microsomes/ Equation 1CL in recombinant CYPx The predicted activities for each CYP isoform in human liver microsomes were estimated by the equation as follows:VCYPx=Vrec­CYPx×RAFCL­CYPx Equation 2where Vrec-CYPx values are the amiodarone N-deethylase activity for recombinant CYP1A2, CYP2C8, CYP2C19, CYP2D6, or CYP3A4. Correlations between the amiodarone N-deethylase activity and ethoxyresorufin O-deethylase activity, paclitaxel 6α-hydroxylase activity, S-mephenytoin 4′-hydroxylase activity, bufuralol 1′-hydroxylase activity, or testosterone 6β-hydroxylase activity in microsomes from six human livers were determined using linear regression analysis. Kinetic parameters were estimated from the fitted curves using a computer program (KaleidaGraph, Synergy Software, Reading, PA) designed for nonlinear regression analysis. Amiodarone N-Deethylase Activity in Human Liver Microsomes. In our preliminary study, amiodarone hydrochloride was insoluble in potassium phosphate buffer (pH 7.4) of more than 50 μM, although it is described in the Merck Index (1996) as being soluble in water at least up to 1 mM as a hydrochloride salt. Therefore, we improved the assay system to increase the solubility of amiodarone in potassium phosphate buffer by the addition of BSA. We confirm that amiodarone was soluble at least up to 200 μM under this condition (data not shown). The amiodarone N-deethylase activity in human liver microsomes was linear with an incubation time up to 45 min and a protein concentration up to 0.5 mg/ml. Unless specified, an incubation time of 30 min and protein concentration of 0.25 mg/ml were employed to ensure the initial rate condition for amiodaroneN-deethylation. Kinetic parameters for the amiodaroneN-deethylase activity were determined using microsomes from six human livers (Table 1). Apparent monophasic parameters were obtained in all samples: the meanKM and Vmaxvalues were 31.6 ± 7.2 μM and 1.2 ± 0.7 pmol/min/pmol of CYP, respectively. 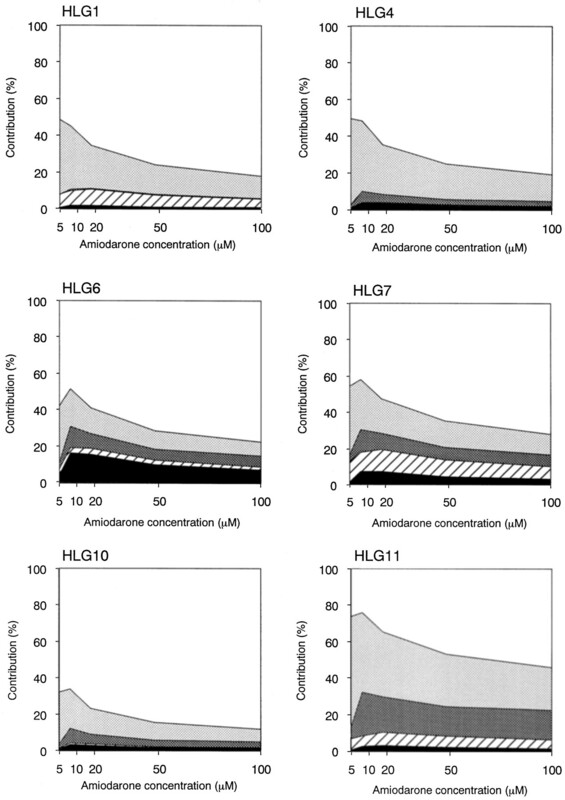 Inhibition Studies of Amiodarone N-Deethylation in Pooled Human Liver Microsomes. CYP-specific inhibitors were screened for their effects on the amiodarone N-deethylase activity in pooled human liver microsomes (Fig. 1). Fluvoxamine (an inhibitor of CYP1A2 and CYP2C19) and furafylline (an inhibitor of CYP1A2) inhibited the amiodarone N-deethylase activity by ∼30% of the control at 100 μM. Paclitaxel was dissolved in dimethyl sulfoxide with a final solvent concentration in the incubation mixture of 1%. Dimethyl sulfoxide of 1% inhibited the amiodaroneN-deethylase activity in pooled human liver microsomes by ∼30%. Therefore, inhibitory effects of paclitaxel were determined in the presence of 1% dimethyl sulfoxide. The amiodaroneN-deethylase activity was inhibited by 100 μM paclitaxel or quercetin (inhibitors of CYP2C8) by approximately 50% and 20%, respectively. S-Mephenytoin (inhibitor of CYP2C19) inhibited the activity by ∼35% of the control at 100 μM. Quinidine inhibited amiodarone N-deethylation by ∼40% of the control at a concentration of 100 μM a condition to inhibit CYP3A4, but had little effect at 10 μM a condition to inhibit CYP2D6. Ketoconazole (an inhibitor of CYP3A4) significantly inhibited amiodaroneN-deethylation to <10% of the control at 10 μM. Erythromycin (an inhibitor of CYP3A4) also inhibited it by ∼40% of the control at 100 μM. Coumarin (an inhibitor of CYP2A6), sulfaphenazole (an inhibitor of CYP2C9), and chlorzoxazone (an inhibitor of CYP2E1) had no effect on the amiodaroneN-deethylase activity at 100 μM. Inhibitory effects of CYP-specific inhibitors on amiodarone N-deethylase activity in pooled human liver microsomes. The amiodarone concentration was 50 μM. The control activity was 0.45 nmol/min/mg of protein. Data are mean of duplicate determinations. An immunoinhibition study was also performed using pooled human liver microsomes at a concentration of 50 μM (Fig.2). It was provided in the data sheets by the manufacturer that the anti-rat CYP1A2, anti-rat CYP2C13, anti-human CYP2D6, and anti-rat CYP3A2 sera at 200 μl/mg of protein inhibited the specific activity of human CYP1A2, CYP2C, CYP2D6, and CYP3A4 by >80%, respectively. As shown in Fig. 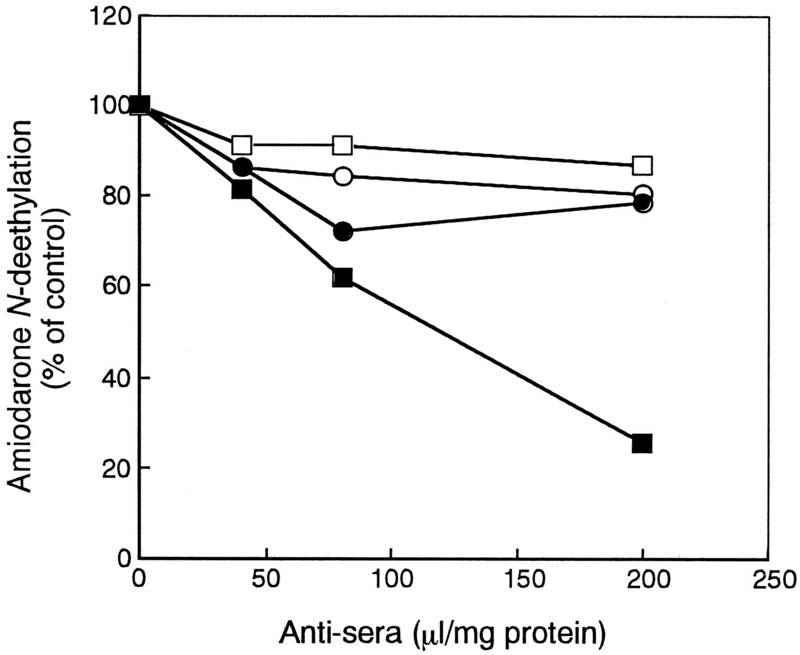 2, the amiodaroneN-deethylase activity was inhibited by anti-rat CYP3A2 serum in a concentration-dependent manner, with 74% inhibition at 200 μl/mg of protein. On the other hand, anti-rat CYP1A2, anti-rat CYP2C13, and anti-human CYP2D6 sera (200 μl/mg of protein) inhibited amiodarone N-deethylation by approximately 19, 21, and 13%, respectively. Immunoinhibition of amiodarone N-deethylase activity in pooled human liver microsomes. Anti-rat CYP1A2 (○), anti-rat CYP2C13 (●), anti-human CYP2D6 (■), and anti-rat CYP3A2 (▪) sera were preincubated with human liver microsomes on ice for 1 h. Preimmune rabbit or goat sera were included in the assay condition to keep the serum concentration being 200 μl/mg of protein. Data are mean of duplicate determinations. Correlations between the amiodarone N-deethylase activity (at substrate concentrations of 5 and 100 μM) and ethoxyresorufinO-deethylase activity, paclitaxel 6α-hydroxylase activity, bufuralol 1′-hydroxylase activity, S-mephenytoin 4′-hydroxylase activity, and testosterone 6β-hydroxylase activity in microsomes from six human livers were examined. As shown in Fig.3A, amiodarone N-deethylase activity at a substrate concentration of 5 μM showed a significant correlation with the paclitaxel 6α-hydroxylase activity (r = 0.842, P < .05) but not with the testosterone 6β-hydroxylase activity. On the other hand, amiodaroneN-deethylase activity at 100 μM was significantly correlated with the testosterone 6β-hydroxylase activity (r = 0.944, P < .005) but not with the paclitaxel 6α-hydroxylase activity (Fig. 3, C and D). AmiodaroneN-deethylase activities at substrate concentrations of 5 and 100 μM did not correlate with the ethoxyresorufinO-deethylase activity, S-mephenytoin 4′-hydroxylase activity, and bufuralol 1′-hydroxylase activity (data not shown). 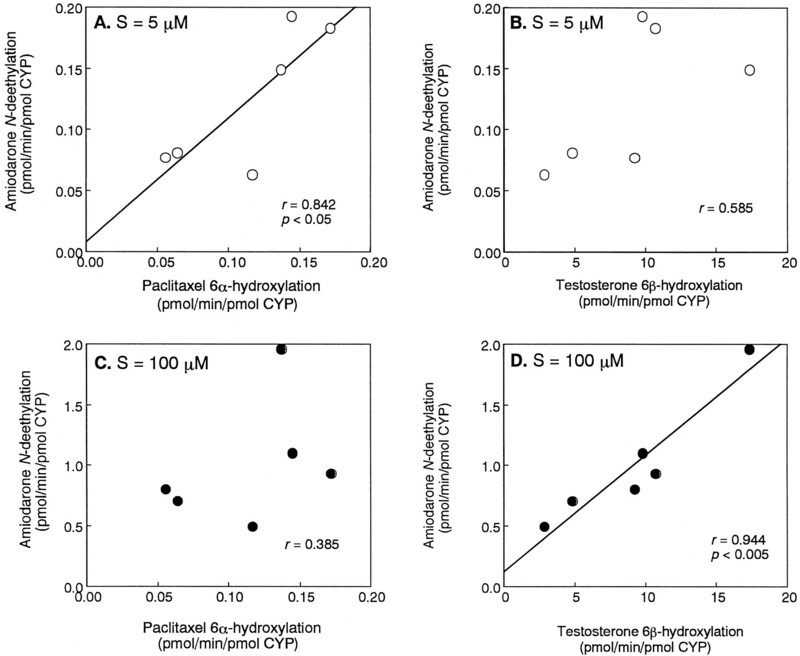 Correlations between amiodarone N-deethylase activity and paclitaxel 6α-hydroxylase activity or testosterone 6β-hydroxylase activity in microsomes from six human livers. Amiodarone N-deethylase activity (5 μM) and paclitaxel 6α-hydroxylase activity (A) or testosterone 6β-hydroxylase activity (B); amiodarone N-deethylase activity (100 μM) and paclitaxel 6α-hydroxylase activity (C) or testosterone 6β-hydroxylase activity (D). Data are mean of duplicate determinations. Amiodarone N-Deethylase Activity in Microsomes from Baculovirus-infected Insect Cells Expressing Human CYP. The abilities of cDNA-expressed human CYPs for amiodaroneN-deethylation were examined. As shown in Fig.4, CYP1A1 showed the highest catalytic activity (13.0 pmol/min/pmol of CYP), followed by CYP3A4+b5 (8.4 pmol/min/pmol of CYP). CYP1A2, CYP3A4, CYP2D6, CYP2C8+b5, CYP2C19+b5, CYP2C19, and CYP2C8 showed moderate amiodarone N-deethylase activity (2.7, 2.7, 2.4, 1.9, 1.3, 1.2, and 1.0 pmol/min/pmol of CYP, respectively). CYP3A5, CYP4A11, CYP3A7+b5, CYP2E1+b5, CYP2C9+b5, and CYP2C9 exhibited low activity (<1.0 pmol/min/pmol of CYP). On the other hand, no activity was observed with microsomes expressing CYP1B1, CYP2A6+b5 , CYP2B6 +b5 , and CYP2C18. Amiodarone N-deethylase activity in microsomes from baculovirus-infected cells expressing human CYP isoform. All CYP isoforms are coexpressed with OR. The concentration of amiodarone was 50 μM. Each column represents the mean of duplicate determinations. ND, not detected. The kinetic parameters of amiodarone N-deethylase activity for recombinant CYPs, which exhibited relatively high activity except CYP1A1, were determined because CYP1A1 is not constitutively expressed in the liver. As shown in Table 2, CYP2C8 exhibited the lowest KM values and CYP3A4 showed the highest Vmax value among the CYP isoforms investigated in this study. The clearances of amiodaroneN-deethylation for CYP3A4 (349.4 μl/min/nmol of CYP) and CYP2C8 (261.3 μl/min/nmol of CYP) were higher than those for CYP1A2, CYP2D6, and CYP2C19 (118.3, 106.8, and 71.7 μl/min/nmol of CYP, respectively). Contributions of CYP1A2, CYP2C8, CYP2C19, CYP2D6, and CYP3A4 to Amiodarone N-Deethylase Activity in Individual Human Liver Microsomes. The KM values of ethoxyresorufinO-deethylase activity in microsomes from six human livers and recombinant CYP1A2 were 0.09 to 0.54 μM and 0.05 μM, respectively. The Vmax values were 9.3 to 261.3 pmol/min/pmol of CYP and 1976.1 pmol/min/pmol of CYP, respectively. The CL values of ethoxyresorufin O-deethylase activity in the human liver microsomes and recombinant CYP1A2 were 45.4 to 919.6 μl/min/pmol of CYP and 38001.9 μl/min/pmol of CYP, respectively. Thus, RAFCL-CYP1A2 was calculated to range from 0.001 to 0.024 (Table 3). The KM values of paclitaxel 6α-hydroxylase activity in the human liver microsomes and recombinant CYP2C8 were 2.58 to 4.55 μM and 2.85 μM, respectively. TheVmax values were 0.224 to 0.583 pmol/min/pmol of CYP and 5.667 pmol/min/pmol of CYP, respectively. The CL values of paclitaxel 6α-hydroxylase activity in the human liver and recombinant CYP2C8 were 0.070 to 0.191 μl/min/pmol of CYP and 1.988 μl/min/pmol of CYP, respectively. Thus, RAFCL-CYP2C8 was estimated to range from 0.035 to 0.096. The KM values ofS-mephenytoin 4′-hydroxylase activity in microsomes from six human livers and recombinant CYP2C19 were 24.4 to 52.3 μM and 24.7 μM, respectively. The Vmax values were 0.092 to 1.532 pmol/min/pmol of CYP and 9.375 pmol/min/pmol of CYP, respectively. The CL values of S-mephenytoin 4′-hydroxylase activity in the human liver microsomes and recombinant CYP2C19 were 0.003 to 0.030 μl/min/pmol of CYP and 0.380 μl/min/pmol of CYP, respectively. Thus, RAFCL-CYP2C19 was calculated to range from 0.007 to 0.080. The KM values of bufuralol 1′-hydroxylase activity in the human liver microsomes and recombinant CYP2D6 were 2.8 to 30.1 μM and 1.5 μM, respectively. The Vmax values were 0.116 to 0.531 pmol/min/pmol of CYP and 6.382 pmol/min/pmol of CYP, respectively. The CL values of bufuralol 1′-hydroxylase activity in the human liver microsomes and recombinant CYP2C19 were 0.005 to 0.152 μl/min/pmol of CYP and 4.255 μl/min/pmol of CYP, respectively. Thus, RAFCL-CYP2D6 was calculated to range from 0.001 to 0.036. The KM values of testosterone 6β-hydroxylase activity in the human liver microsomes and recombinant CYP3A4 were 32.9 to 46.0 μM and 34.6 μM, respectively. TheVmax values were 4.0 to 23.1 pmol/min/pmol of CYP and 165.4 pmol/min/pmol of CYP, respectively. The CL values of testosterone 6β-hydroxylase activity in the human liver microsomes and recombinant CYP3A4 were 0.091 to 0.585 μl/min/pmol of CYP and 4.780 μl/min/pmol of CYP, respectively. Thus, RAFCL-CYP3A4 was calculated to range from 0.019 to 0.122. The amiodarone N-deethylase activity by recombinant CYPs at each substrate concentration is shown in Table4. According to eq. 2, the predicted amiodarone N-deethylase activity (VCYPx) for the respective CYP isoforms in microsomes from six different human livers were estimated. The contributions of CYP1A2, CYP2C8, CYP2C19, CYP2D6, and CYP3A4 to amiodarone N-deethylase activity in six human liver microsomes at each substrate concentration are illustrated in Fig.5. It was revealed that CYP3A4 was the major isoform that catalyzes amiodarone N-deethylation. CYP2C8 showed the second highest percentage contribution to amiodaroneN-deethylation. With the increase of the substrate concentration, the percentage of the contribution of CYP3A4 was increased and that of CYP2C8 was decreased. At 5 μM, CYP3A4 showed a 2-fold higher contribution than CYP2C8 in HLG6 and HLG10. In HLG1, HLG4, and HLG7, the contributions of CYP3A4 and CYP2C8 were similar. On the other hand, in HLG11, CYP2C8 showed a 2-fold higher contribution than CYP3A4 to amiodarone N-deethylation. The contributions of CYP1A2, CYP2C19, and CYP2D6 were minor in most of the microsomes. However, significant contributions of CYP1A2, CYP2C19, and CYP2D6 were observed in HLG11, HLG6, and HLG7, respectively. Thus, there was an interindividual variability in the percentage contribution of each CYP isoform to amiodarone N-deethylase activity in the different human liver microsomes. Significant correlations were observed between the measured amiodarone N-deethylase activities and the predicted activities at all substrate concentrations examined in the present study (r = 0.866, P < .05 at 5 μM; r = 0.984, P < .001 at 10 μM;r = 0.962, P < .005 at 20 μM;r = 0.926, P < .01 at 50 μM; andr = 0.931, P < .01 at 100 μM). 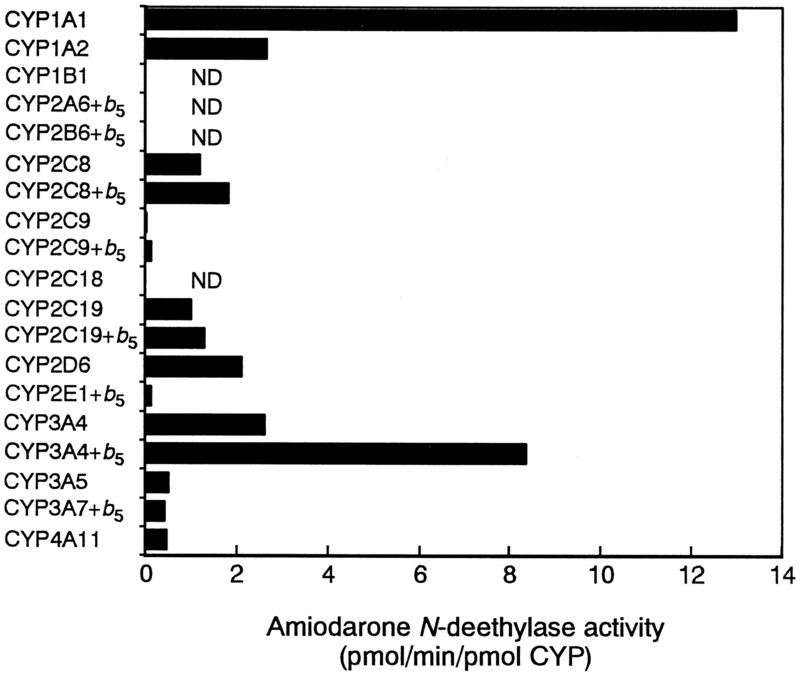 The percentage contribution of each CYP isoform to the amiodarone N-deethylation in microsomes from six human livers. The contributions of CYP1A2 (dark gray), CYP2C8 (light gray), CYP2C19 (black), CYP2D6 (cross-hatched), and CYP3A4 (white) were estimated at substrate concentrations of 5, 10, 20, 50, and 100 μM, respectively. Amiodarone, a drug administered for the cure of life-threatening supraventricular and ventricular arrhythmias, has been reported to interact with a number of drugs such as theophylline (Hirsch et al., 1993), phenytoin (Nolan et al., 1989), warfarin (O'Reilly et al., 1987; Heimark et al., 1992), and flecainide (Funch-Brentano et al., 1994). In our previous study (Ohyama et al., 2000), it was revealed that these drug interactions resulted from the inhibition of CYP activities by desethylamiodarone rather than by the parent drug. It has been reported that the formation of desethylamiodarone from amiodarone is primarily catalyzed by CYP3A in humans (Fabre et al., 1993; Trivier et al., 1993). In the present study, we identified the CYP isoforms involved in amiodarone N-deethylation in human liver microsomes and evaluated the percentage contribution of each CYP isoform. Previously, the kinetic parameters of amiodaroneN-deethylase activity in human liver microsomes have been reported to be KM = 0.33 ± 0.11 mM and Vmax = 2.38 ± 0.74 nmol/min/mg of protein (Fabre et al., 1993). On the other hand, the parameters obtained in the present study were KM = 31.6 ± 7.5 μM and Vmax = 1.2 ± 0.7 pmol/min/pmol of CYP (0.52 ± 0.35 nmol/min/mg of protein). It is possible that the improvement in the solubility of amiodarone in the present assay system decreased the KMvalue, because Fabre et al. (1993) did not take the insolubility into consideration. The chemical and immunological inhibition studies using pooled human liver microsomes revealed that CYP3A4 is the primary isoform responsible for amiodarone N-deethylation at a substrate concentration of 50 μM. In addition, weak inhibition by paclitaxel, quercetin, furafylline, and fluvoxamine suggested that CYP2C8 and CYP1A2 play minor roles in this reaction. The concentration of amiodarone in human plasma has been reported to range from 0.65 to 5.7 μM in clinical situations (Stäubli et al., 1983). Because the serum binding ratio of amiodarone has been reported to be 96% (Lalloz et al., 1984), the unbound amiodarone concentrations were calculated to be 0.03 to 0.23 μM. It has been reported that amiodarone is highly accumulated in the liver because of the high lipophilicity (Berger and Harris, 1986). The total concentration of amiodarone in the liver has been reported to range from 7.1 to 1580.6 μM in postmortem and biopsy samples (Latini et al., 1984; Berger and Harris, 1986). Therefore, the correlation study was performed at substrate concentrations of 5 and 100 μM as the low and high concentrations, respectively. The results shown in Fig. 3 indicated that CYP2C8 was involved in the amiodaroneN-deethylation in human liver microsomes at a low amiodarone concentration. On the other hand, CYP3A4 participates in amiodaroneN-deethylation at a high substrate concentration. The findings supported the results of the predicted contribution of each CYP isoform in human liver microsomes estimated from the RAF (Table 4). The present results showing that the KMvalue of recombinant CYP2C8 was the lowest (8.6 μM; Table 2) and theVmax value of CYP3A4 was the highest (18.9 pmol/min/pmol of CYP; Table 2) among the five recombinant CYP isoforms also supports the results of the prediction. The concept of RAF to extrapolate data from recombinant CYPs to those from human liver microsomes was first proposed by Crespi (1995). In our previous study, we concluded that the RAFCL(Nakajima et al., 1999a) is more appropriate to estimate the contribution of CYP isoforms than RAFV (Kobayashi et al., 1997; Nakajima et al., 1998) and RAFVmax(Crespi, 1995). Furthermore, concerning the source of recombinant CYPs, it was suggested that microsomes from baculovirus-infected insect cells expressing CYP isoforms could be more useful for an appropriate prediction than those from B-lymphoblastoid cells (Nakajima et al., 1999a; Roy et al., 1999). In addition, it was also suggested that the coexpression of b5 is preferable. Therefore, we used the RAFCL to estimate the relative contribution of CYP1A2, CYP2C8, CYP2C19, CYP2D6, and CYP3A4 in human liver using microsomes from baculovirus-infected insect cells expressing each CYP isoform and OR (b5 was coexpressed for CYP2C8 and CYP3A4). In our estimation of the relative contributions of multiple CYP isoforms using RAFCL, it was revealed that CYP3A4, CYP2C8, CYP1A2, CYP2D6, and CYP2C19 were the CYP isoforms catalyzing amiodarone N-deethylation. As reported previously (Fabre et al., 1993; Trivier et al., 1993), CYP3A4 is the major isoform involved in amiodarone metabolism. On the other hand, CYP2C8 was also significantly responsible for amiodarone N-deethylation at a low concentration, as supported by the correlation study (Fig. 3). The number of drugs that are metabolized by CYP2C8, such as paclitaxel (Rahman et al., 1994), rosiglitazone (Baldwin et al., 1999), zopiclone (Becquemont et al., 1999), and troglitazone (Yamazaki et al., 1999), is increasing. Therefore, for the prediction of drug interactions with amiodarone, the drugs metabolized by CYP2C8 as well as those by CYP3A4 should be taken into consideration. Although the contributions of CYP1A2, CYP2C19, or CYP2D6 were minor, these isoforms might alternatively contribute to amiodarone N-deethylation in clinical situations in which CYP3A4 or CYP2C8 is inhibited by coadministered drugs. In conclusion, the present study suggested that CYP2C8 as well as CYP3A4 was significantly involved in amiodaroneN-deethylation in human liver. In addition, CYP1A2, CYP2C19, or CYP2D6 exhibited minor contributions to amiodarone metabolism. The relevance of these CYP isoforms would be dependent on the content of each isoform and on the amiodarone concentration in the liver. We thank Taisho Pharmaceutical for providing amiodarone and desethylamiodarone and acknowledge Brent Bell for reviewing the manuscript. A part of this study was supported by a grant-in-aid from the Ministry of Education, Science, Sports, and Culture of Japan. (1995) Ketoconazole and sulphaphenazole as the respective selective inhibitors of P4503A and 2C9. Xenobiotica 25:261–270. (1999) Characterization of the cytochrome P450 enzymes involved in the in vitro metabolism of rosiglitazone. Br J Clin Pharmacol 48:424–432. (1999) Cytochrome P-450 3A4 and 2C8 are involved in zopiclone metabolism. Drug Metab Dispos 27:1068–1073. (1986) Pharmacokinetics. in Amiodarone Pharmacology, Pharmacokinetics, Toxicology, and Clinical Effects, eds Harris L, Roncucci R (Medicine et Science Internationales, Paris), pp 45–98. 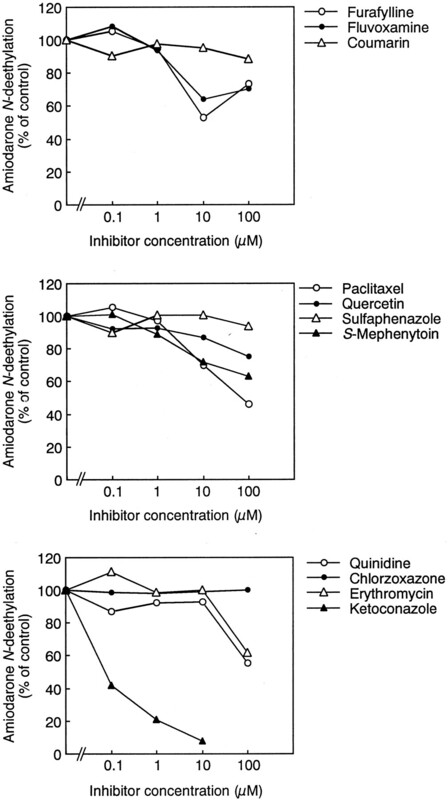 (1989) Effect of quinidine on the dextromethorphan O-demethylase activity of microsomal fractions from human liver. Br J Clin Pharmacol 28:29–36. (1993) Oxidative metabolism of omeprazole in human liver microsomes: Cosegregation with. S-mephenytoin 4′-hydroxylation. J Pharmacol Exp Ther 266:52–59. (1995) Xenobiotic-metabolizing human cells as tools for pharmacological and toxicological research. Adv Drug Res 26:179–235. (1993) Evidence for CYP3A-mediated N-deethylation of amiodarone in human liver microsomal fractions. Drug Metab Dispos 21:978–985. (1994) Variable disposition kinetics and electrocardiographic effects of flecainide during repeated dosing in humans: Contribution of genetic factors, dose-dependent clearance, and interaction with amiodarone. Clin Pharmacol Ther 55:256–269. (1992) Amiodarone: An overview of its pharmacological properties, and review of its therapeutic use in cardiac arrhythmias. Drugs 43:69–110. (1991) Reaction and significance of cytochrome P-450 enzymes. J Biol Chem 266:10019–10022. (1986) Oxidation of quinidine by human liver cytochrome P-450. Mol Pharmacol 30:287–295. (1992) The mechanism of the interaction between amiodarone and warfarin in humans. Clin Pharmacol Ther 51:398–407. (1993) Interaction between theophylline and amiodarone. Ann Allergy 70:68. (1983) Amiodarone pharmacokinetics. Am Heart J 106:840–847. (1982) Amiodarone kinetics after oral doses. Clin Pharmacol 31:438–444. (1988) Electrophysiologic effects of desethylamiodarone, an active metabolite of amiodarone: Comparison with amiodarone during chronic administration in rabbits. Am Heart J 115:351–359. (1997) Identification of cytochrome P450 isoforms involved in citalopram N-demethylation by human liver microsomes. J Pharmacol Exp Ther 280:927–933. (1984) Binding of amiodarone by serum proteins and the effects of drugs, hormones and other interacting ligands. J Pharm Pharmacol 36:366–372. (1984) Clinical pharmacokinetics of amiodarone. Clin Pharmacokinet 9:136–156. (1998) Involvement of CYP1A2 in mexiletine metabolism. Br J Clin Pharmacol 46:55–62. (1999a) Azelastine N-demethylation by cytochrome P-450 (CYP) 3A4, CYP2D6, and CYP1A2 in human liver microsomes: Evaluation of approach to predict the contribution of multiple CYPs. Drug Metab Dispos 27:1381–1391. (1999b) Inhibitory effects of azelastine and its metabolites on human CYP isoform activities. Drug Metab Dispos 27:792–797. (1989) Pharmacokinetic interaction between intravenous phenytoin and amiodarone in healthy volunteers. Clin Pharmacol Ther 46:43–50. (2000) Inhibitory effects of amiodarone and its N-deethylated metabolite on human cytochrome P450 activities: Prediction of in vivo drug interactions. Br J Clin Pharmacol 49:244–253. (1987) Interaction of amiodarone with racemic warfarin and its separated enantiomorphs in human. Clin Pharmacol Ther 42:290–294. (1987) Resting, and rate-dependent depression of Vmax of guinea-pig ventricular action potentials by amiodarone and desethylamiodarone. Br J Pharmacol 92:97–103. (1997) Distinction of CYP1A1 and CYP1A2 activity by selective inhibition using fluvoxamine and isosafrole. Biochem Pharmacol 53:531–538. (1994) Selective biotransformation of taxol to 6α-hydroxytaxol by human cytochrome P450 2C8. Cancer Res 54:5543–5546. (1999) Development of substrate-activity based approach to identify the major human liver P-450 catalysts of cyclophosphamide and ifosfamide activation based on cDNA-expressed activities and liver microsomal P-450 profiles. Drug Metab Dispos 27:655–666. (1983) Serum concentrations of amiodarone during long term therapy: Relation to dose, efficacy and toxicity. Eur J Clin Pharmacol 24:485–494. (1993) Amiodarone N-deethylation in human liver microsomes: Involvement of cytochrome P450 3A enzymes (first report). Life Sci 52:91–96. (1999) Oxidation of troglitazone to a quinone-type metabolite catalyzed by cytochrome P-450 2C8 and P-450 3A4 in human liver microsomes. Drug Metab Dispos 27:1260–1266. (1991) Purification and characterization of human liver microsomal cytochrome P-4502A6. Mol Pharmacol 40:679–685.